Sugar Maples in Fall - What a site to see two full size sugar maples trees with their fall colors on display. 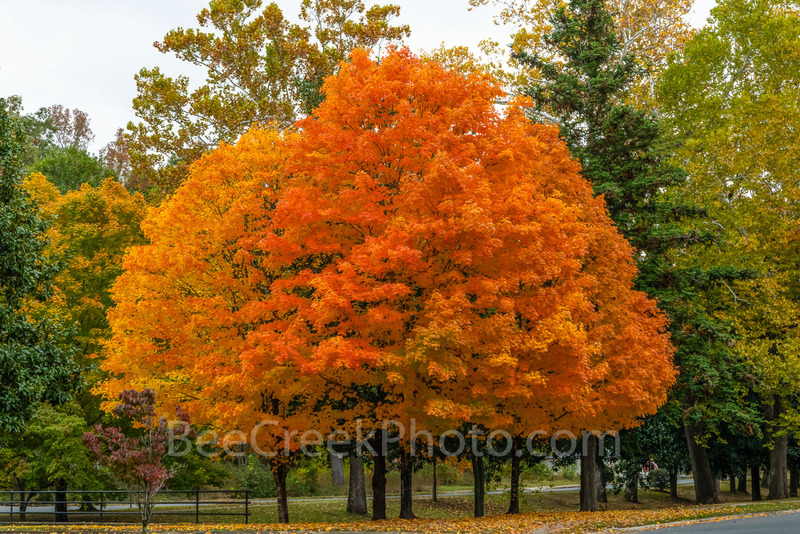 It was stunning to see not one but two of these beautiful trees with their autumn foliage in stunning colors of oranges and yellow. We were probably here on the best day because the wind was starting to pick up and you can see the leaving were starting to drop already and the next day it stormed there as we were leaving. We understand that sugar maple leaves leaves turn yellow in the shade, red in the sun, and, depending on the proportion of sun and shade, and other factors they change hourly from yellow to red to orange. These trees obviously did not get direct sun but just enough to give us some beautiful orange and yellow colors. What triggers this change every autumn season in their color of the foliage is the shorter days, and tempertures as the night get cooler are all factors in their lovely colors.